It's been a long time coming, but we finally have the successor to the GoPro Hero4 Black and it's called (surprise, surprise) the GoPro Hero5 Black. The latest action cam packs in many of the features we're sure GoPro fans were hoping for, and certainly makes some welcome improvements on the Hero4, including GPS and waterproofing, all bundled into a similarly tiny package. It's about time, too: GoPro was being overtaken by its rivals, most notably Garmin with the Virb Ultra 30, so it needed to make a big comeback. With the Hero5 it's done exactly that - read on to find out more. The Hero5 Black keeps a very similar design to its predecessor, and that's no criticism. It's definitely a case of big things and small packages, at 44.5mm tall and 62mm wide, weighing 117g. The power button, which has been a constant through the Hero series so far, is no more. Instead, you have a button on the side and still one at the top, and you'll be able to use both to move around the menus. That's particularly handy when in water, as the rear 2-inch touchscreen won't be as helpful. The Hero4's front red light, used to indicate the camera is recording, has also now been moved up to the top left corner. Other than that, the bite-sized camera is still very similar, albeit now with a rubber finish that will give you more grip when it's wet. That's important, because the new waterproof design (to 33 feet) means you don't have to stick it in a case when you want to take it surfing. When it comes to shooting video, the Hero5 can capture 4K at 30 frames per second, 2.7K at 60fps. 1440p at 80fps and 1080p at 120fps. A selection of views are also available, including a new one called Linear that removes the super wide angle fish eye, and is really made for use with GoPro's upcoming Karma drone. You also SuperView, Wide, Medium, Narrow modes to choose from, although some won't work with certain resolutions. The cam can also capture wide dynamic range 12-megapixel stills and supports RAW photos. 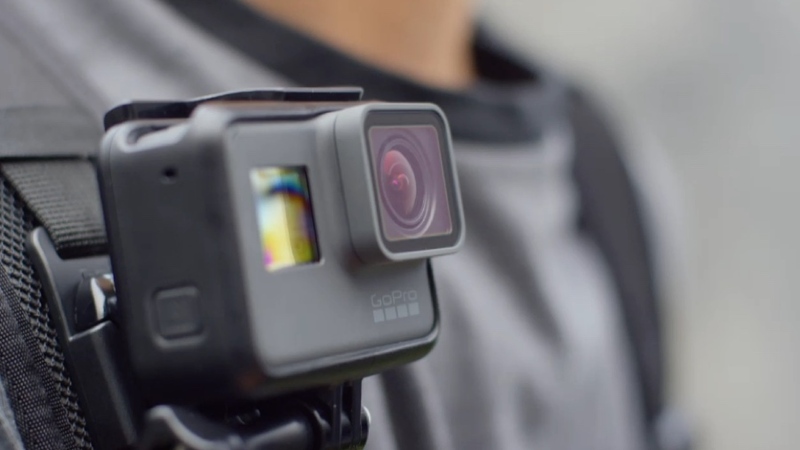 GoPro hasn't managed to fit in optical image stabilisation, but it has what it calls electronic image stabilisation, which is more focused on helping fix shaky camera footage. Also helping you get the perfect shots will be 30 mounts and accessories compatible with the Hero 5 Black, which is set to work with GoPro's new Karma drone. A new voice control mode on the Hero5 Black lets you command "GoPro, start recording" to get it rolling. You'll be able to tell it do perform a variety of functions hands free including asking it to take photos while recording or jump into burst mode when you're taking a time-lapse video. There are seven supported languages: English, German, French, Italian, Spanish, Chinese and Japanese. That voice control is possible thanks to three microphones, which also aim to improve audio recording by delivering stereo audio, along with better wind noise reduction. Plus, it'll cherry pick the best audio to soundtrack your videos. Once you've finished recording and you're ready to juice up the battery, the Hero 5 Black can automatically start syncing to the GoPro Plus cloud-based subscription service to back up your footage. The service will cost $4.99 per month. And, as mentioned further up, the Hero5 Black can be submerged up to 30 feet deep in water without the need for additional housing, which is one of the biggest new features to come to the camera. The Hero5 Black is priced at $399 and is available now. Times have been tough for GoPro with sales in steep decline, so it's the perfect moment for the company to launch its latest camera. We're also awaiting the Karma drone, which goes on sale 23 October for $799. Joining the Hero5 Black is the dinky little Hero5 Session. Billed as the most durable action camera it's ever made, the new Session is also waterproof sans housing, has a simple one button control system, includes voice control and has the same waterproofing as the Hero 5 Black. You can also record in up to 4K at 30 fps like the Black and you can use the free GoPro app to use your smartphone screen as a viewfinder, to edit content and automatically offload content to GoPro Plus. It's $100 cheaper than the Hero5 at $299, but only shoots up to 10-megapixel images, doesn't capture RAW, and lacks the built-in GPS. It also lacks a screen.